If you’re following the 5G wireless mega trend in tech, you probably read a disconcerting bit of news from Verizon this week. Today, I’m going to address that bit of news and show you why it allows more time to profit from the trend. On Wednesday, Verizon announced that it was pausing its 5G Home broadband rollout. 5G Home is designed to give you up to 1.4 GBs of broadband internet access in your home without a messy landline. Given Verizon’s massive wireless coverage map in the U.S., 5G Home will open up true high-speed internet access to a much broader customer base than even existing landlines. There is only one problem — a lack of 5G capable hardware. Last week I noted that the real rollout of 5G access from Verizon wouldn’t come until the latter half of 2019. I also predicted a demand spike for companies like Ultra Clean Holdings Inc. (Nasdaq: UCTT) as hardware makers rush to catch up with the 5G rollout. That demand spike seems even more solidified now that Verizon will be pushing to get hardware in consumers’ hands so it can proceed with its first-to-market 5G Home wireless service. The lesson here is that hardware like semiconductors, 3D NAND flash memory chips and integrated circuits are key to the 5G mega trend in tech. Verizon’s delay was obvious to market watchers — it’s why Verizon stock has barely been dented by the news. However, this delay gives you more time to get in on the ground floor of this trend before it really catches fire. On that note, there is one company with 5G wireless ties that is poised to break out right now. Plexus Corp. (Nasdaq: PLXS) is a step up the technology food chain from Ultra Clean. The company designs, develops and manufactures electronics solutions for the health care, industrial, communications and aerospace/defense markets. Its products include the integrated circuits, control boards and processors that are crucial in making 5G wireless hardware. Where Ultra Clean makes the tools to manufacture tech components, Plexus makes the boards and integrated circuits that surround them. And Plexus is positioned in a key part of the market, with customers including Micron Technology, Apple and Arris — which makes the 5G wireless modems that will help push the technology into your living room. In 2018, Micron and Arris accounted for a combined 20.5% of Plexus’ net sales. Defense contractor General Electric accounted for another 12.2% of net sales. Make no mistake: The defense and aerospace sector will also be a key driver for 5G wireless technology. Revenue growth is solid, coming in at 13% in the most recent quarter and projected at 11.7% in the current quarter. Full-year revenue growth for 2019 is expected to come in at 10.7%, with 2020 seeing growth of just 7.1%. These analysts’ projections are cautious due to the current uncertainty surrounding 5G wireless’s rollout. Once the ball starts rolling, however, I expect many analysts to boost their projections. Despite the news of delays in Verizon’s 5G rollout, you don’t want to wait to invest in Plexus. And that’s because the stock’s price is on the verge of a considerable breakout. The shares hit a near-term peak of $62.37 in early December and plunged to a low of $47.62 the day after Christmas. This pattern is significant because PLXS stock just moved above a 50% retracement of the high and low. These retracements are technical levels watched by many traders, and moves above or below them are seen as buy and sell signals. Right now, PLXS is kicking out a buy signal. 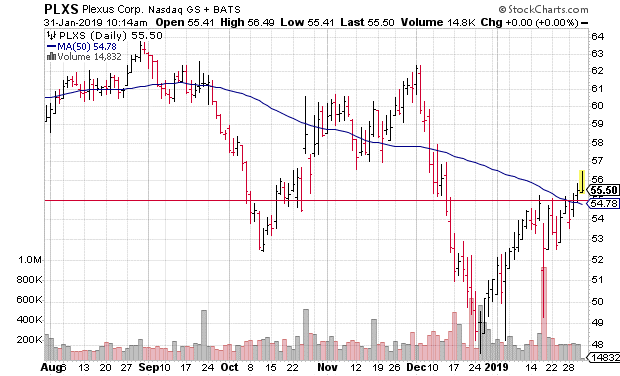 In addition to the 50% retracement breakout, PLXS stock has also moved above its 50-day moving average. This gives technical traders another buy signal, and is a sign that bullish sentiment is returning to the shares. In short, PLXS stock is in the beginning stages of another run higher. It’s time to get in before the stock takes off once again.